MOSCOW, Apr 12 (PRIME) -- Steel production of Russia’s Severstal grew 0.4% on the year to 3.044 million tonnes in January–March, the company said in a statement on Friday. 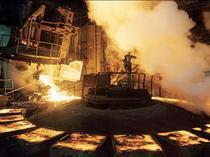 Cast iron production rose 1% to 2.363 million tonnes. Consolidated sales of steel products went up 1% to 2.832 million tonnes. Semi-produced good sales fell 53% to 121,000 tonnes, rolled goods’ ones rose 7% to 2.311 million tonnes, coal sales except sales between units of the company rose 32% to 532,000 tonnes, iron ore rose 15% to 1.656 million tonnes.